The refinement of 3D protein structure determination techniques has generated a considerable wealth of structural data stored in databases such as PDB. Taking full advantage of this knowledge, Anaxomics has developed a target-centric approach on the basis of chemical similarity between known targets and other characterized proteins. The theoretical principle behind this methodology is simple: similar molecules tend to have similar properties and, particularly, tend to bind the same ligands. In the context of drug development, this means that if the known targets of a drug bear structural resemblance to other proteins that have previously been studied, the latter will also likely be targets. Therefore, when information about drug targets is available, it is possible to identify additional targets by performing a similarity search. 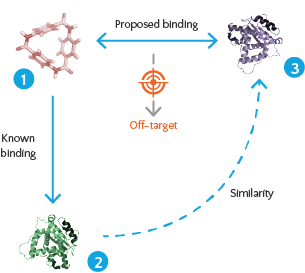 Depending on the structural knowledge of the target protein, the similarity search can be done at different levels: sequence similarity, 3D similarity or binding site similarity. The higher the similarity between the homologues and the original targets is, the higher the probability that the identified proteins are real targets. By discovering new off-targets, a target-centric approach may be applied to characterize the safety profile of a drug or as an essential step of drug repositioning. This method reaches its full potential when used together with a systems biology analysis as a part of the integrated solution developed by Anaxomics.